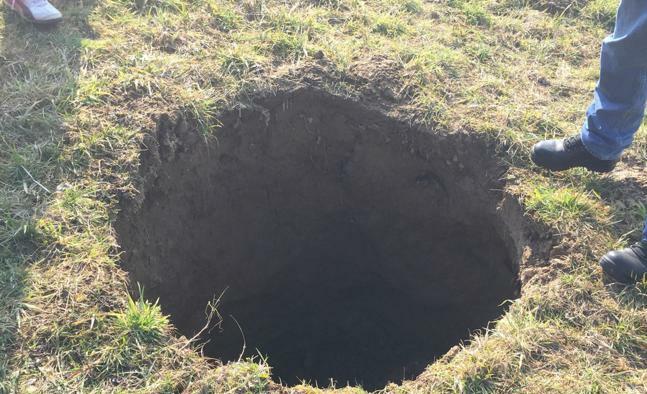 Nobody understands what happened, disbelief villagers Gučani, settlements in the area of ​​Brestovac, the eastern part of the Požega Valley glances into the hole that opened yesterday in a pasture above the village, a hundred meters from their cemeteries. When and how to open the hole in the ground width of about 1.5 meters in diameter and a depth of more than three meters – no one knows, but noted the first walkers and immediately informed journalists Voice of Slavonia. – Locals do not remember that such holes opened in this area, and all of them wonder almost completely symmetrical dimensions, clean-cut, almost ideal circular shape – says Tomo Vrhovac, Gučani resident, who has called and to see a miracle. Among the locals spread the story that they might re-visited by aliens, who a few years ago rolled over large areas of cereals in regular geometrical shapes in the field Brestovac. How are the neighboring village Ivandol archaeologists discover ancient settlements there last and archaeological excavations, locals are hoping that perhaps at them in terms of what a settlement or a new archaeological site. Basically, a coherent explanation does not, because, as they say, the days there was not some larger and more abundant rainfall in this area, so the reasons for opening of such a large hole poems treats imaginative stories. This entry was posted in Galleries, Pictures and tagged sinkholes, Slovenia. Bookmark the permalink.